Sometimes I hear one of you saying "I am not sold on eye creams". You know what I think about it? "You lucky you!". If you need it, then you know it. Now read this, I can do without facial moisturizing for a few days, but without an eye cream, I can't go pass 24 hour mark. Dry under eye area is no fun, it is very uncomfortable. Combine it with under eye circles, you double the fun. Any concealer would accentuate the dry flakes and make it feel even drier. Setting the concealer, better not! The story of my life, I have been searching for the right eye cream and concealer combination. I am thinking to feature some of the eye creams I have been testing for you with similar problems. Also I would love to hear what works for you best and open a discussion for dry under eyes ladies, ready? Let's start with La Mer The Illuminating Eye Gel. 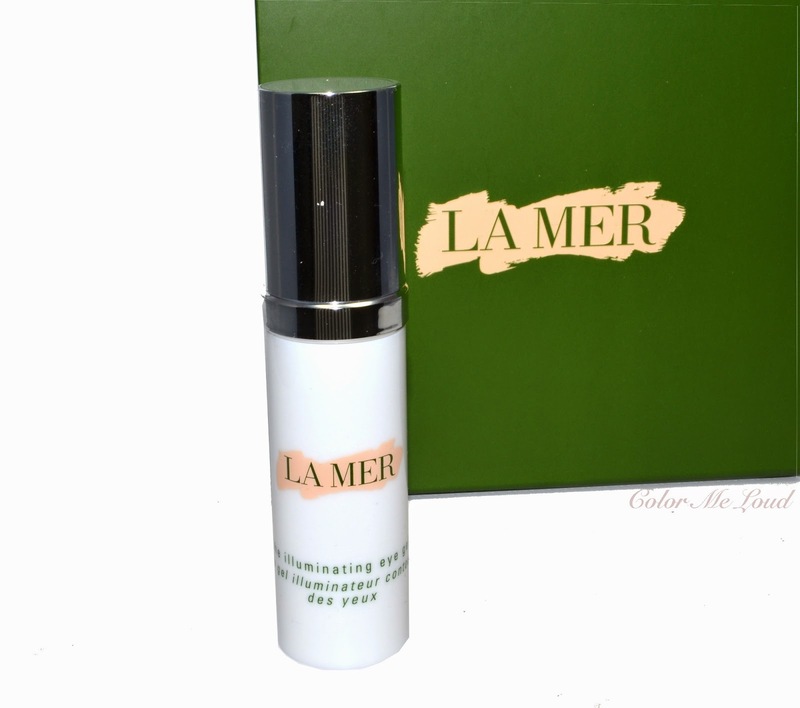 My first encounter with La Mer Illuminating Eye Gel caught me by surprise. This is the first product I have tried from the brand. Although I have heard lot of good things about it, I was not sure what to expect. As it is written in the instructions, I have applied one pump of the eye gel on my left ring finger finger, distributed it on equally on my right ring finger and applied it under my eyes. There was enough slip so I didn't have to tap these but you can swipe it across your skin. with what is left on my finger I swiped it on the eye lid as well. 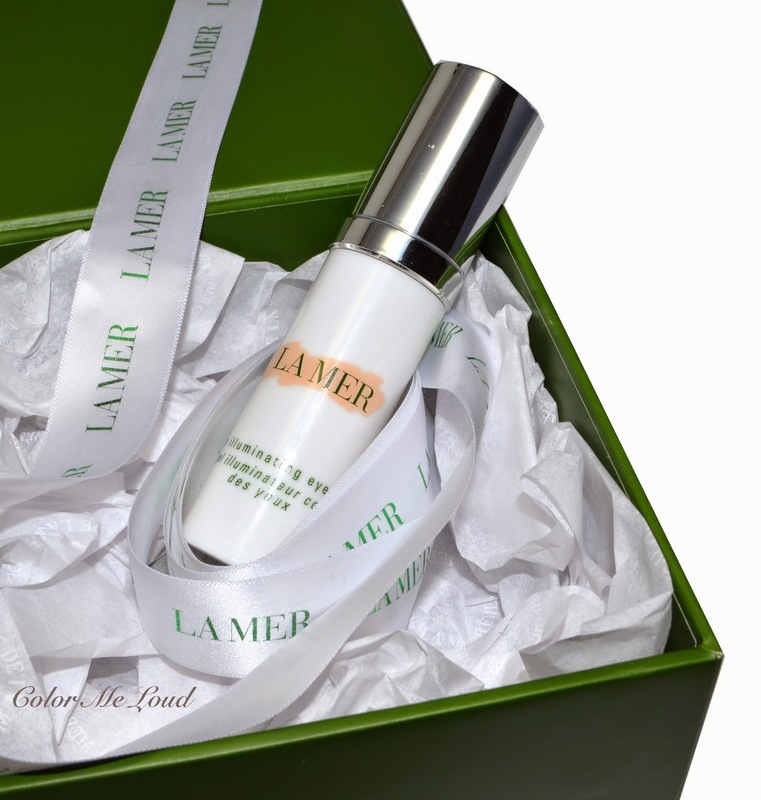 Not all the eye creams are suitable for applying over the lids but in its instructions La Mer Illuminating Eye Gel is recommended to be applied both under and over the eye area. First I have felt a cooling sensation, this is great in the morning to calm the puffiness and feels fresh. My bottle didn't come with an ingredient list but I believe this sensation points out to an hyaluronic acid rich content. Also from the slip I believe that there are some silicones in the formula. It feels really good after the application. The surprise with this is that usually the effect of the gel or cream lasts about half an hour if it is a good one but with this, it lasts hours long. I apply it at night and in the morning it feels very hydrated and smooth. I also apply it in the mornings before my makeup. After the first usage, I was intrigued to see if this effect would go on as my skin gets used to it. I am using Illuminating Eye Gel around three weeks now. I am glad to see that it still works. The cooling and moisturizing effect on the eyes lasts long and hours after application it feels good. What surprised me most is to see that after a short sleep how it takes away the signs of fatigue around the eyes. You know I am taking photos of myself everyday to share the make-up looks with you. If I don't sleep good, it takes forever to shoot a photo which I can use. Even in this case, portrait needs a lot of work on software. After I started using Illuminating Gel, I noticed that I hardly needed a touch up under the eyes. No puffiness and certainly less dark circles. Is it magic? Am I dreaming? If so please don't pinch me! I have now one and only concern though. After I started using the product, my very hydrating under eye concealers started smudging on me. This must be because I don't have all that "dryness" under the eyes anymore. Now I started searching for a concealer to match the Illuminating Eye Gel. Have you tried La Mer Concealer? Might that be the one? Be sure to check out Lily's review on La Mer Illuminating Eye Gel. She just became a mother 2 months ago. As she is suffering a (happy) lack of sleep, her review has proven that I am not imagining things and this one really does work. Final thoughts: Three weeks with La Mer The Illuminating Eye Gel and I am sold. I will definitely repurchase it. It really does a good job in hydrating the area and hiding the sleepless nights. Now I have to find a matching concealer to this formula. Have you tried La Mer Illuminating Gel? I would love to hear the thoughts of you with similar dry under eye area problem. Tell us what works for you and what doesn't. Thanks for the shout out, Sara :-) And yes, this eye gel works! You might want to get an undereye concealer that isn't too slippery now, which is a happy problem. Have you tried Estee Lauder ANR Eye before? It's also pretty good. However, by far, this is the best yet. Hi Lily, I have tried Estee Lauder ANR. I really like it but as you mentioned La Mer Illuminating Gel is like magic lol. I never tried any La Mer, as the price tag scares me. At the moment I am using Sunday Riley Start Over Eye Cream, which sounds similar in texture. Luckily my undereye area isnt dry at all, so I cant tell wheter it would work on this issue. thanks for sharing your experience. I haven't tried Sunday Riley, maybe I should give it a go. I really need something with lots of hyaluronic acid. I have tried Rexaline which was fine but after an hour it was dry again. I don't really know how La Mer achieves a long lasting cooling, hydrating effect. Sigh... Sara! Come on! I really fid not need to read this, honestly! Lol! I am a skin care nut case, and make all these crazy promises of jot ever looking at a certain brand/store you name it! Now I need to swallow it all up and get this. I really font have so many wrinkles but the dryness kills me. Was goiNg to ask you.. What is the concealer you use? im wearing the By Terry Terryblyss. Love it... Doesn't crease at all but runs on the dryer side I would say, do gotta really moisturize it. Not dessert dry, just dry enough not to budge or slip all over. Might work for you now... I dont even want to go check the price of this potion! I have the same problem and so happy you are blogging about skin care. Would love it if you mentioned the active ingredients where you know them. I have a number of concealers and I like the Eli Fass which I do wear over eye cream with no problem. But what makes the most difference I think is layering in sequence with time in between. So apply eye cream earlier as you are getting ready and make up later. I am using Dior Hydraskin concealer or Dior Star concealer at the moment. In the past I have tried Chanel but found it too drying. If I can hydrate enough, I reach for Cle de Peau, which is a great concealer too. With this cream, I can even use Laura Mercier Secret Camouflage directly under the eyes, lol. This one is $145 but you really need a very small amount. I am hoping it will last me long. Go to a store and try it will you, then tell me how you found it. Oh and I have to check Terryblyss concealer. We don't have a counter here though so color matching is not an option. I also want to try La Mer Concealer next. LOL, yes it is so practical isn't it. I am happy that I installed it. I also don't have to check and modify comments all the time. I have to try some Caudalie, I will look into that. This one really works wonders, if it lasts a long time, I will certainly buy it again. I am happy to hear that you are interested in this. My bottle came without anything listed on it and I have tried to find the list online without any success. I need to try Eli Faas too. You are so right about time, I need to apply this one like half an hour ago and go with the concealer afterwards. In the morning though, it is sometimes a little tricky. Oh I understand how it feels to find a skincare product that just really works! :D Though I am very loyal to my face moisturizer, eye cream is the one skincare product I like experimenting with. I change brands all the time and I don't know if that's a good thing. LOL. I have been tempted to use Disqus on my blog but until they let me use my own font then I won't switch! Haha. I'm cray cray like that! this is funny about the font. I am just the opposite, for many things I call "details" I don't care. But your attitude is just right for a scientist, love it! I am on a very experimental phase about skin care at the moment, changing everything almost monthly. I will try to post about them more often. I have heard about Paulaschoice, it is a really good resource. Before writing the post, I have checked them out too. I have hardly any wrinkles on the eyes but to prevent them from happening is also important. I believe dry eyes would make more wrinkles too. Thanks for stopping by. LOL Linda, I have heard La Mer Concealer first from you and tried it at the counter, I loved it. Now it is time to splurge. I think the key is really to wait between the gel and the concealer as discussed below but I can't manage it sometimes in the morning. Let me know how you find Illuminating Eye Gel if you get to try it. I don't really need an eye cream all that much so I won't be able to spend that much money on an eye cream - for now. I'm pretty sure that will change over the years, haha. I've heard great things about this though and I'm very glad that it works out for you. I did have issues with eczema under my eyes which I couldn't get rid of and the Kiehl's Avocado Eye Treatment solved that amazingly. It gives me enough hydration on an everyday basis. It sound like an interesting product! Finding a night eye cream is easier for me than for the day because I can use pretty much any rich cream for the night. What I'm using right now: for the night - Is Clinical Youth eye cream (perfect) , Kiehl's Avocado cream (quite oily, when skin is really dry), Pevonia Evolutive Eye Cream (is effective and price is reasonable), MBR CytoLine eye cream (really good but pricey). During the day I just apply one of these two light gels under my eye and also a bit on the upper lid (instead of eyeshadow base) - Arcona peptide eye serum or Dr. Dennis Gross Ferulic + Retinol Triple Correction Eye Serum. These give me an extra moisturizing around the eyes, without melting my sunscreen or eyeshadow. My skin is very oily, but when it is suddenly dry I use Is Clinical or MBR also during the day, both are great products. I apply the same face sunscreen also around the eyes, but if I feel I need a bit of highlighting and extra moisiturizing (or when I rubbed my eyes and removed my spf), I always have a Clinique eye cream spf15 with me and apply it on top (I wear no makeup). It is slightly toned, so it also replaces me a corrector on my bad days. I only have CdP corrector, which I find very dry and Trish McEvoy liquid corrector which is well balanced - not drying but not too rich. I have a sample of this eye cream.But , I hear this is for first signs of aging -I do not have bad undereye problems-yet I am not a spring chicken of 30-so not sure if I need a more anti aging cream-there is a special on the La Pararie caviar eye cream-have u heard much about this one? I don't know what "first signs of aging" should mean. It sounds like a marketing thing. All I know is that this is very hydrating and my eyes love it lol. La Praire is also something I should look into. I am trying not to put something very oily under my eyes. Also over the eyes an oily emulsion is rather not a good idea. I know what you mean about night though, a richer cream would do but in the morning we need something which is absorbed quicker. Can your skin be oily but not hydrated? Because usually oily can't be dry. I am also going to check out Clinique one, thanks for pointing that out to me. you are so lucky! I always had a dry under eye area, so in years I fear it might be even worse. We will see. Now you are the second one to mention Kiehl's Avocado Eye Treatment, I should really check it out! congrats!!! I didn't know. You had your first baby last year right, then you were a little silent and now the second one? You are so blessed! Wish you luck with that, keep us posted. we want baby photos! OMG 3 already? Congrats, this time it is a girl!!! Yay! So exciting. yes that is great with Kiehl's. I should check it out, but I am pretty sure La Mer is unbeatable lol. Sara, what's the name of this "moisturizing concealer"? All concealers dry out my under-eye skin in just couple of hours, so I don't use them at all, but wouldn't mind something more creamy. Thank you! Great review! I'm thinking of buying the Illuminating eye gel as well! I have a very dry under eye area. 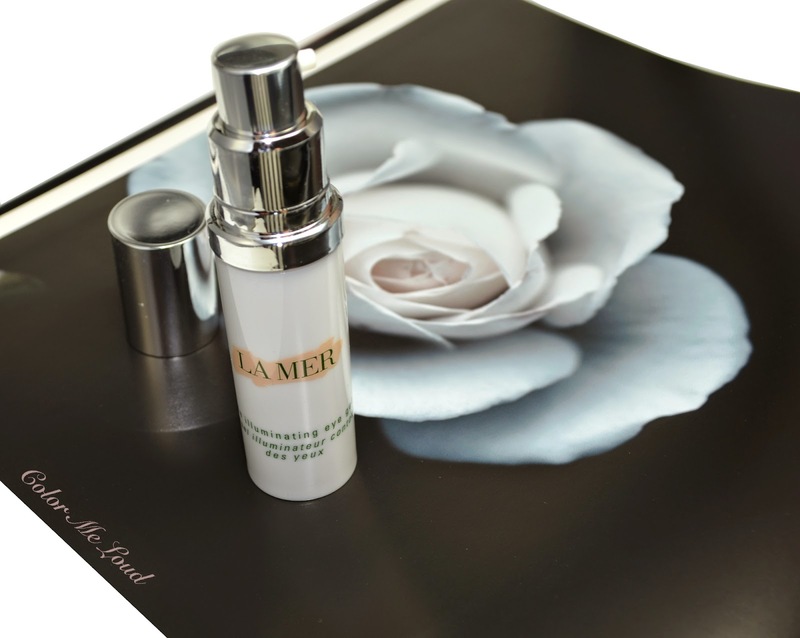 Please let us know about the La Mer concealor as soon as you've tried it! I just started using this eye gel along with the La Mer concealer and they make a great combo! You have to apply the concealer with a brush (it comes with a good one), and you lightly apply it to the bottom and edges of the areas of darkness or baggy parts, then gently tap in with a fingertip using whatever is left on your fingers to tap a little in closer to the eye area. I also lightly dust the La Mer translucent loose powder over this once it dries completely. It is moisturizing enough to keep skin smooth, but not so much that your eye makeup will smudge. I am loving this combo! I use the concealer and love it. I use it how LA Mer recommends. I rub my finger on the product a few times to warm it and pat it in, no brush or sponge at all. It's amazing. I only use it directly under my eyes and if I want extra highlight I use the by terry pen concealer below that. I set it with LA Prairie loose powder and have no creasing. It lasts forever! I have oily skin so can't use the La Prarie powder all over my face but these products have changed my under eye game. Also, the new formula la mer foundation is my holy grail, even for oily skin!